Are you really claiming that compressed air went through a door, into a shaft, down a hallway, etc, and out the window? That's what you think happened? Compressed air seeks the path of least resistance and I know that as a fact. In fact, we had to send an Air Force C-141 to the boneyard after volcanic ash got into places within the airframe that we thought was airtight. These would have to be very durable vents. Explosion-proof vents. How did squibs of compressed air get to the outside if this building? There is an interesting feature of buildings like the WTC. They're called exterior walls. There also is already air on those floors, so when air comes in, where does the air go that is already there? You seem to be talking about static pressure. I'm not convinced that any window on any floor, more less every window save one, can contain the static pressure required to eject the material in the videos. Why would you assume that this is possible? It sure seems like an impossibility to me. You seem to be talking about static pressure. Just to let you know that I am still waiting for you to post those video time lines and failing to post those time lines will prove my point that no explosives were used to demolish the WTC buildings. Who do you think these dust plumes made it? 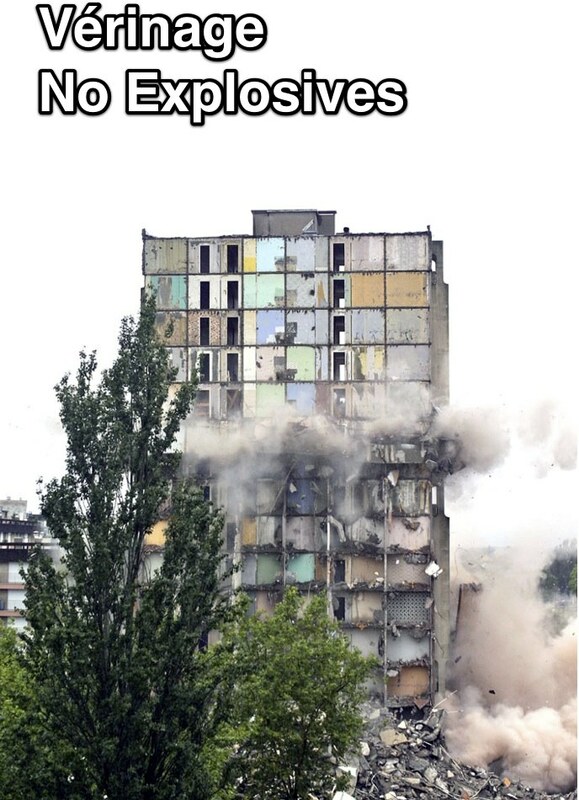 The question isn't whether or not dust can be ejected during a building collapse. The question is about where the dust and debris is ejected. How does it happen a dozen stories away from the collapse? I have shown you photos where dust plumes were ejected from windows as in this case. The same way it did it here. Right, it's exactly the same, only different. What you're obsessing about is the debris ejected at the point of building collapse. I don't think anyone questions this, I certainly don't. My inquiry is a bit more focused. Speaking of videos, where are those video times lines that I have been asking for? Right, it's exactly the same, only different. What you're obsessing about is the debris ejected at the point of building collapse. Just to let you know that WTC buildings were not air tight after the impacts. Can you point them out? I don't see any demolition squibs in any your images. How does the compressed air get from the stairwell to the window? Excuse the **** out of me, but did I just read that correctly? Is anyone really so scientifically illiterate that they don't know how air gets from a high pressure area to a lower pressure area? You are stalling! Where are those video time lines? Could it be that you don't want to post those WTC video time lines because the time lines prove no demolition explosives were used? It is all there in the photo and you are stalling again! Squibs are compressed air and I am very sure you have seen them in the photos that I have posted. Now, quit stalling and post those video time lines or throw in the towel. You read it correctly. The behavior of air follows very predictable rules. The question is which of these rules can be applied in a fashion that explains the observations. We're looking for a more rigorous explanation than simply saying the wind did it. We want to know what wind did it. Last edited by steveupson; 8th September 2016 at 09:06 PM. I don't doubt that those speeds are possible. I'm simply wondering how they occur somewhere else in the building. So, does this answer put to rest the question if anybody's ever "done the math?" Only in your CD delusions. In the real world, not so much. Do you want me to provide a link, quote, etc from Bazant? Cuz you shouldn't be asking this if you're curious and have done some research into my answer. The one that followed the red arrow in the diagram. Doesn't seem to have a very firm grasp on cause and effect, does he? A link or a quote would be greatly appreciated. I can't find any information on this. What you need to do is to come up with what I asked for. Peculiar that you would say such a thing considering the questions you've posed. Are you playing a game? You're the greatest and the smartest and the most pleasant person on the entire intertubes and I'm just a know-nuthing scumbag and I apologize for desecrating the memories of the victims of 9/11. There is a very good reason why you don't want to tackle the video time line challenge because you would have to admit to us all, that you cannot find evidence for CD explosives. One Truther after another have failed to take on that challenge with the exception of one Truther and he made the mistake of taking on the challenge by posted a known hoaxed video. When I revealed the video was a hoax, he disappeared. Do you have a mouse in your pocket? I assume from the lack of knowledge, fluid dynamics is Greek to you. The irony, the OP is about discussing an article done by 9/11 truth liars based on speculation. The paper is nonsense, the same as the imaginary squibs, not used on 9/11. The article is clearly based on speculation, a nice term for nonsense, lies and BS. I can understand why some people are a little fixated on me, wanting to figure out who I am since I'm new here. But I'm not really all that interesting. I think the subject matter that I'm trying to discuss is a lot more interesting than I am. Whether I know more or less than you think I know will not have any effect on the events that occurred during the collapse of the towers. If a garden hose is full when you switch on the tap, water will exit the end of the hose immediately, not when the water at the tap end makes it all the way to the open end. This doesn't require any great scientific knowledge or calculations or cites or papers, just everyday experience; and at your age and with your claimed scientific background it should not come as a revelation. This is why people are accusing you of trolling - nobody can be as stupid as you appear to be. How does the pressure cross the room? In other words, how is it contained during this journey? This question is so strange it appears deliberately obtuse. 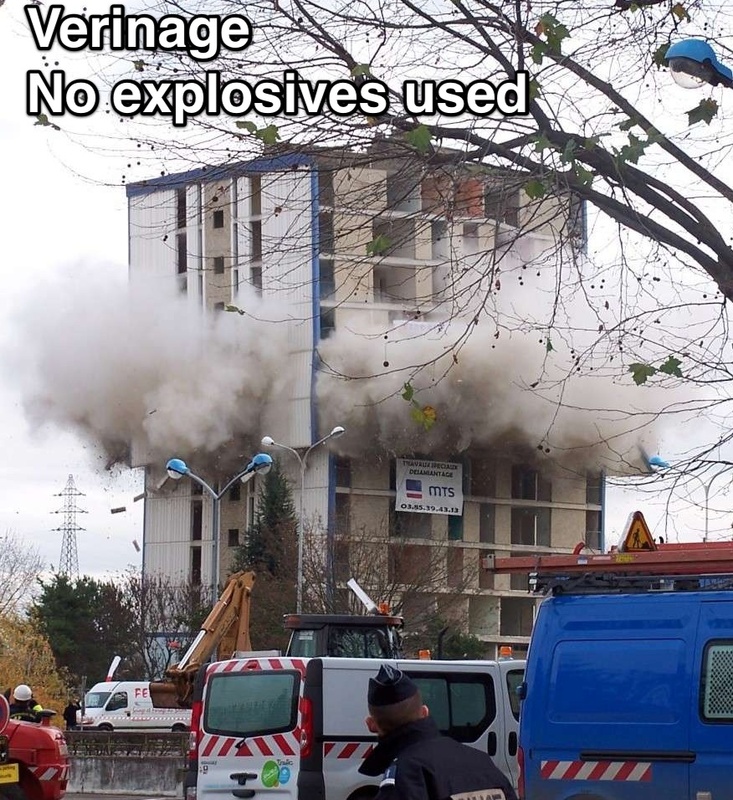 A 200ft wide building is collapsing and, as floors pancake down, a portion of the air on each floor is forced down the buildings vertical shafts. The resulting overpressure spreads onto each floor below and bursts out of any weak points. Does any part of that seem counterintuitive to you? Well, you're all dancing to steveupson's tune, and so have I been. I think it's time to stop. This whole sequence has been a very successful attempt to reverse the burden of proof. steveupson, you've been asked to present your evidence that the ejecta are anything to do with explosives, and the best you've been able to come up with is that it looks that way to you. They don't look that way to any of the rest of us, so that's the end of it. If you want any more responses from me, present some real evidence or calculations rather than vague guesses. Until then, enjoy wasting your time. Well, you're all dancing to steveupson's tune, and so have I been. I think it's time to stop. Troll feeding is a self sustaining - self reinforcing exercise. steveupson, you've been asked to present your evidence that the ejecta are anything to do with explosives, and the best you've been able to come up with is that it looks that way to you. He's also said that nanothermite did it, but then that "[i]n order for a loud sound to be produced some energy would have to be transmitted into the air somehow. If the charge doesn't transmit energy into the air then you wouldn't hear it", and when confronted with the fact that in that case it would not be able to produce the ejections for the same reasons, all we got is crickets. Which boils down to: he doesn't really have an explanation, but that's the only "smoking gun" he has and has to protect his belief. Right. A hose would be required. Without the hose, how would the water get from here to there? The question isn't that complicated so I don't understand why you've accused me of trolling. Do you think that there was some kind of hose between the shaft and the window? In order for this "overdpressure" to occur the air must be contained somehow. How was this pressure contained. The windows certainly aren't strong enough to contain it, so what is the containment vessel? I guess you either missed or are deliberately misinterpreting my question. I'm looking for any information at all on this question. If there's no information one way or the other, then we should be able to agree that there's no information. Why would it be wrong to assert this fact, if it is indeed true, which I'm not claiming it is. Just because I don't know of any rigorous explanation doesn't mean that none exists. Someone may have already worked this out and I just haven't seen it. In any case, why do you require some burden of proof beforehand? Isn't that thinking bassackwards? No, you're not. You're imposing an asymmetric burden of proof, where you're insisting that the default explanation has to be explosives for no other reason than that you've called the phenomena "demolition squibs," and are then demanding rigorous and numerically accurate proof of any other explanation before you'll consider it as a competitor to your blind guess. The explanation you've already received is vastly more comprehensive than anything you've advanced to support the claim you implied right at the start and have continued to imply throughout, and all you're doing now is trying to sustain an argument from ignorance by seeking out new areas to be ignorant of. In that respect, at least, you're doing a great job. You must have missed my response to that objection. The squibs can be the result of malfunctioning, possibly due to improper installation. I think I said they could have been installed backwards.